In the blank grid, Solver will fill 0 or 1 indicating whether credit in that row is matched with debit in that column or not. This area is (C6:G35 in my workbook) is known as variable cell range in Solver model. A credit can be matched with only one debit – ie sum of any row in C6:G35 range can be 1, at most. Total reconciled amount should be less than or equal to total credits – ie sum of any column in C6:G35 should be less than values in C5:G5 (debits). To facilitate these rules, also known as constraints in solver parlance, let’s use column H & row 36. Write =SUM(C6:G6) in H6 and fill down the formula. Write =SUMPRODUCT($B$6:$B$35,C$6:C$35) in C36 and drag sideways to fill the formula in rest of the columns. To do its work, solver needs an optimization cell. Our goal is to maximize the amount of reconciled amount. So, in a blank cell write =SUM(C6:G36). This will be our optimization cell. Objective is to to maximize J6. When you are ready, Click Solve. Solver should take few minutes to find the solution. 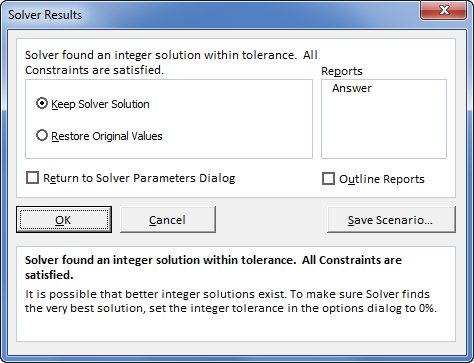 Once solver finds an answer, it will show Solver Results dialog. Click ok (you may also look at the sensitivity report). 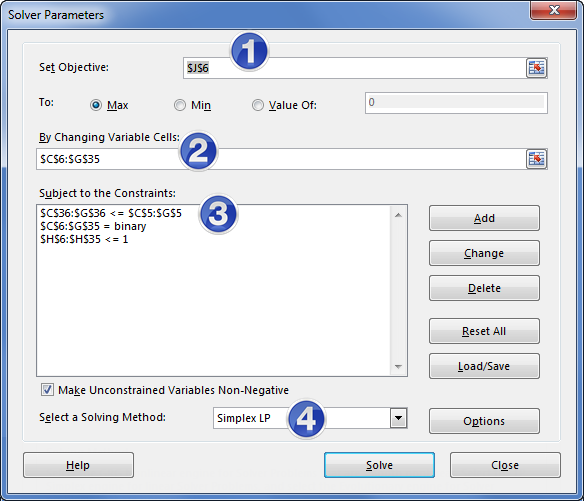 This loads the solver solution in to variable cell range. Analyze the numbers and enjoy. What if Solver solution is not optimum? Occasionally, Solver fails to find optimum solution for linear problems with integer constraints. In such cases, try again by adjusting constraints & precision. Please click here to download the example workbook. 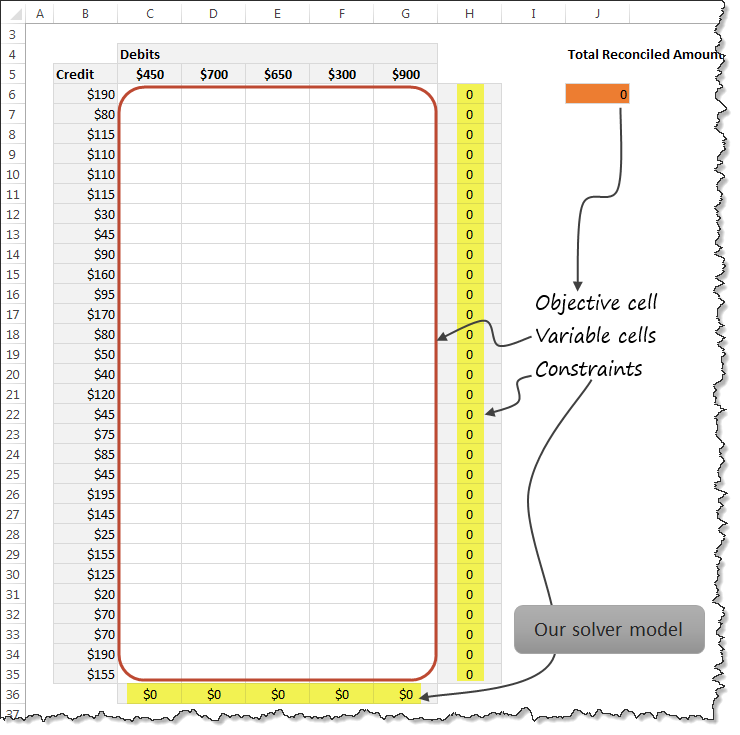 Play with the solver model to learn more. How do you reconcile data? Solver is a powerful way to reconcile data. It does take some time to set up the model and configure solver, but once your model is ready, Solver does all the heavy lifting. What about you? What methods do you use to reconcile data? Please share your thoughts and tips in the comment section. Great example of how solver can be useful and easy to use in practical life ! Hi Frank, the optimization cell should sum up row 36. Check your formula. Is it the case that the text above in the post should read =SUM(C36:G36) and that's what's tripping some readers up? Thanks for this post, it's a useful demo of solver! How long should it take for solver to solve the problem this example? I have input everything exactly as listed in the example, but my objective cell is optimized at 3009 instead of 3000. When I attempt to make the objective = 3000 or to update the precision, solver runs for hours. Thank you in advance for your help! On my computer, Solver took less than 5 minutes to find the solution. I made one change to the constraints though. I used H6:H35=1 as constraint. With H6:H35<=1 as constraint, solver took more than 10 minutes. I usually press Escape after few minutes to see if Solver has a good enough solution. Solver is very useful. In my previous organization, I have used it to do production scheduling that could give optimal returns. Its interesting to see your article on Solver Chandoo. Great! Nice use of Solver, but I would like to know if we can write binary in constraints?? I am getting with this binary..
Hello, I have a data below. how can we use Solver to identify what items are netted to 0?